The 2017 University of New England Spring Graduation was celebrated on the lawns of Booloominbah on Friday 27 and Saturday 28 October. Twenty-one Aboriginal and Torres Strait Islander students graduated from the University of New England. Alongside those beginning their careers, Professor Jack Beetson and Mrs Dianne Roberts were awarded an Honorary Doctor of Letters honoris causa (HonDLitt). Professor Beetson is honoured for his outstanding and ongoing contribution to adult education in Indigenous communities both in Australia and overseas. Mrs Roberts received this award for her distinguished service to the Aboriginal community within the broader New England region as well as her continuing service to the Oorala Aboriginal Centre at UNE and in Aboriginal education, generally. Greg Davison, Oorala’s Director commented, that ‘these Honorary Doctorates are an important milestone in building stronger relationships with the Aboriginal people. 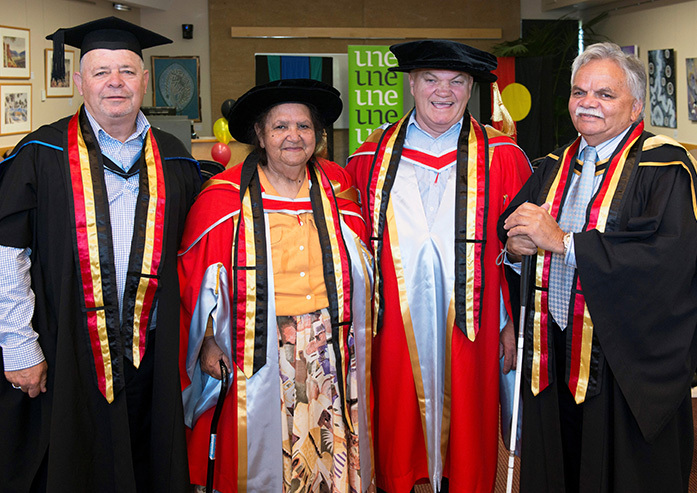 This recognition is a first in the history of UNE to bestow Honorary Doctorates within the Aboriginal community’. The number of Aboriginal and Torres Strait Islander Students at UNE has grown from a mere handful 30 years ago to over 800 enrolled students in 2017 with support from the Oorala Aboriginal Centre. The University of New England Spring Graduation brings the total of Aboriginal and Torres Strait Islander Students who have graduated to 806.